What makes our company stand out from the others? It is our dedication to delivering excellent service to every single one of our clients. At Garage Door Repair Santa Monica we don't just claim to be the best, we actively work to stay that way by constantly striving to improve every aspect of our company. One important factor that makes us the most recommended company around is the fact that we always complete our work within the allotted timeframe. We know that everyone values their time, so we never waste it. Once we arrive at your home, we immediately begin our inspection. and once we've determined the root of the issue, we inform you and then proceed with the necessary repair work. Our technicians are always prepared and come virtually loaded for bear, with all the necessary tools and equipment. In order for a gate to last as long as it can, it is necessary to have it routinely undergo the proper maintenance. Our experts adhere to our professional guidelines for this process and use the proper lubricant for each different part of the gate. We check for malfunctioning and worn out parts and then promptly replace them if that proves to be necessary. If you do not want to complicate things and have no time to study your newly installed intercom system, we can easily handle its programming for you. Our technicians always keep themselves updated with the latest intercom systems available in the market, so we know how to operate every single brand and model. We are always ready to share some basic information with our clients, as well as offer them some of our professional tips. 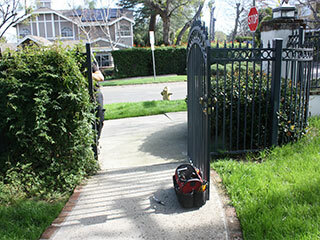 We handle all kinds of repair work, including ones for gates that are made of wrought iron. We have all the tools and replacement parts needed to perform this service instantly and without any hassle and inconvenience to our customers. We do the process carefully to avoid further damage to the gate. Contact our experts in Garage Door Repair Santa Monica today to have our professional technicians take care of all of your gate related problems. No matter what kind of services you may need, all you have to do is call us. We're here to provide you with comprehensive advice and all the repair and maintenance services you need for keeping your garage and home safe. We are a local company, so you know we're here to help whenever you need us. Thank you for choosing Garage Door Repair Santa Monica! One of our experts will be in touch soon. Feel free to browse our website for FAQ, tips and more useful information in the meantime!